…are not always good ones. We’ve been in this house now for just over a month. For the most part it’s been a dream, but we are continuing to have problems with our roof. The problem lies in the fact that the architect was definitely a “form over function” designer and seemed to forget the fact that flat roofs are not necessarily practical. We have a sloped roof that has two sections of flat area where water tends to pool up when it rains. We had some leaking in the guest bedroom closet during some really heavy rains when we first moved in, but we tarped up the roof and it was okay. Since then we haven’t had any issues, and yesterday a local roofer came in and took off the flat shingles and put on a single-shingle (say that 10 times fast) roof so that it would not leak. Well, I came home late last night and wanted to stay up to watch Womens’ Gymnastics to see the results myself before they were ruined by Facebook. Thank goodness I did! It was raining, not hard, but it was a good slow steady rain. As I’m sitting on the couch, I hear a distinct drip drip drip from somewhere behind me. I look back and see water on the floor–look up and see water coming out of one of the light fixtures in the ceiling. Oh crap. 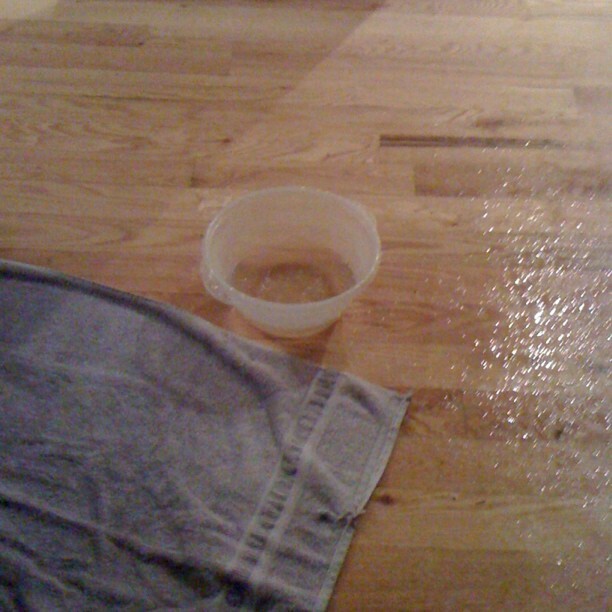 I run upstairs and find that there is water just pouring out of the smoke alarm in the guest bedroom. As Cameron fumbles out of bed I run up to the third floor to see if anything is dripping up there. It’s not, so that means the leak must be coming from the second floor roof, which is right next to the third floor balcony. (We have a confusing house.) While Cameron runs for the tarp, I run back downstairs, grab some mixing bowls, and set them under the leaks so that the carpet doesn’t get destroyed. Even after we tarped up the second floor roof, there was still water coming out of the alarm for a good 20 minutes, which I’m sure means that there must be water pooling in a cavity below the shingles somewhere. Long story short, the dripping eventually stopped and we were able to clean up the mess. We have the roofer returning tomorrow to take a look at where the problem is, but I have a feeling we’ll need a contractor to come out and make sure there isn’t damage in the drywall in the ceiling. I worry that the structural integrity may have been damaged because a lot of water came down. Obviously something went wrong with the new roof, because we have never had this problem before. Hopefully the roofer will be able to figure it out before anymore damage can happen. In other news, last night was my last night shift at the restaurant, meaning that from here on out I’ll have my evenings at home with Cameron. Not a moment too soon. I kicked things off tonight by making dinner of bacon-and-cheddar stuffed burgers and feta bleu cheese mashed potatoes. Tomorrow night our good friends Kyle and Chris are coming to visit for the first time, so I’m doing a lemon and herb roasted chicken, homemade garlic french fries, citrus glazed carrots, and a lemon and cranberry cake. I do so love cooking especially when I get to do it for friends. I will update on how it comes out! I am not pregnant yet. I am not even off my birth control yet. But I am already having cravings. For being pregnant. Am I the only one who’s experienced this? Surely not. But some days I feel plain out of my mind. My biological clock turned on early, relatively speaking. I remember it turning on sometime around 19 or 20, after years of saying that I didn’t want kids. I wasn’t even in a longterm relationship at that point, but it definitely turned on. Then, about a year ago, a friend of mine from high school announced on Facebook that she was pregnant–and I was so jealous that I cried. (I mean, to be fair, I had a lot of other things on my mind; I was fresh out of college, unemployed, home alone most of the time and lonely–but I was definitely also very, very jealous.) I’m sure that on an emotional, biological level, my body knew that I had locked down a mate and it was prime time to start baby-makin’. And since then I have experienced what I can only describe as cravings for being pregnant. I desire it so much some days it nearly hurts. There’s no particular reason we’re waiting a little longer to start the TTC process. If we got pregnant right now by accident, it wouldn’t be a big deal. We just bought a house and we’re going to be officially married in two months (I say officially because we’ve been living together for a year and a half now; most days I already feel “married”), and on top of that we both have stable employment, health insurance, and savings in the bank. For being young twenty-somethings just recently out of college, we’re doing pretty well. And I’m really grateful for that, because it’s going to make things that much easier when we do get pregnant. We’ve both discussed getting off birth control now and just letting it happen when it happens, but we still haven’t decided if that’s what we’re going to do. To be very honest, though, we’re going to Hawaii next January and I’d rather not be miserable during that time. And, a secondary reason to wait, my mom (hi Mom) has long requested that I not make her a grandmother until she’s 50–which is next November. Statistically speaking, she has nothing to worry about, but I hope otherwise. In any event, the plan for right now is to wait until my birth control runs out in November, which gives me a couple months to let my system regulate itself before we head to Hawaii for the honeymoon–and then, all bets are off. Even if that means making Mom a grandma before she’s 50–sorry Mom. Finally, a question for moms: did you experience these cravings before getting pregnant? Is this a totally normal, biological thing for me to feel, or am I just nuts?! I’m trying to publish a book. I’ve been querying agents for a year now and have had little luck so far other than rejections. It’s a process that I had to psych myself up for before I embarked, because the average author receives anywhere from 30 to 60 rejections before getting a bite. I’ve lost count of how many agents I’ve queried but it’s somewhere in the 2 dozen range, so I know that statistically speaking, I have a long way to go. 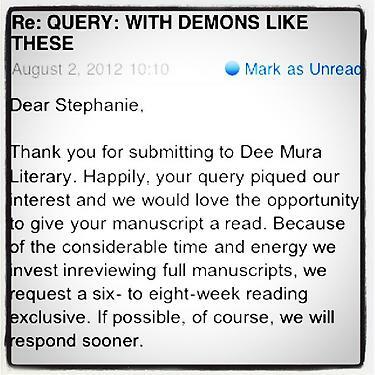 Today, however, I received my very first manuscript request! This means that an agent was interested in my query and now wants to read my full manuscript. I know that this doesn’t mean an acceptance by any means, but this is still an immense accomplishment for me and I’m so excited. Despite how much I’ve told myself that I will have to expect rejections, it’s impossible to not get a little down when all you’re getting is rejection after rejection. When I opened my e-mail this morning and saw a response, I wasn’t even excited to open it because I was anticipating another rejection. I was definitely excited to see something else! So at this point, my little baby is in someone else’s hands. It’s been read by a number of my friends for editing purposes and whatnot, but this is the first time it’ll head to someone who probably isn’t going to sugar coat it if it really is garbage. In any event, this is a really welcome piece of news today. I’ve been feeling a little down about having to withdraw from culinary school and this really gave me some confidence, especially because this book is the lovechild of my ultimate passion and it makes me feel better about my writing.